Are you a stair parts novice? With all the different terminology involved in staircase and balustrade construction, it can become a little overwhelming to anyone looking through our product range of staircases. 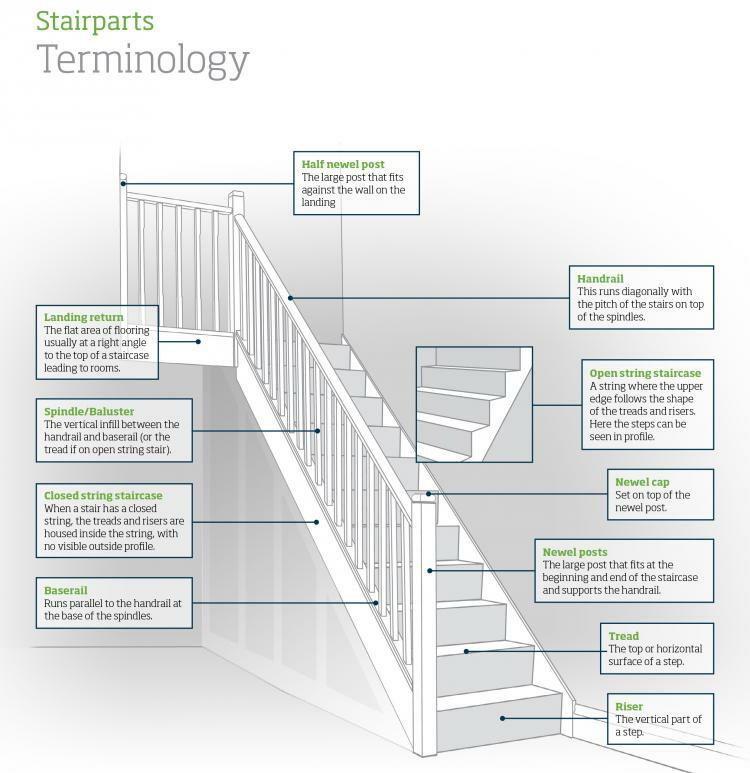 This glossary of stair-related terminology details the most common terms used in staircase and balustrade construction. This will then help you choose the correct parts needed for your perfect staircase. We have split our terminology guide up into two seperate posts, please find the other one here. The flat area of flooring usually at a right angle to the top of a staircase leading to rooms. The vertical infill between the handrail and baserail (or the tread if on open string stair). When a stair has a closed string, the treads and risers are housed inside the string, with no visible outside profile. Runs parallel to the handrail at the base of the spindles. The top or horizontal surface of a step. The large post that fits at the beginning and end of a staircase and supports the handrail. Set on top of the newel post. A string where the upper edge follows the shape of the treads and risers. Here the steps can be seen in profile. This runs diagonally with the pitch of the stairs on top of the spindles. The large post that fits against the wall on the landing. Part two of our terminology guide can be found here.